UTSA Honors College student awarded fellowship from Military Family Research Institute (MFRI) at Purdue University. (Nov. 6, 2018) -- A UTSA Honors College student is the recipient of the 2018 Focus Forward Fellowship and hopes to share the untold stories of female veterans and service members who may be struggling with mental health problems and trauma due to sexual assault and other tough circumstances. Jennifer Brett enlisted in the U.S. Navy soon after high school and served for 20 years as a Sonar Technician, working on ships and instructing other sailors. During her military service, Brett experienced sexual assault and said she didn’t let terrible experiences define her. Instead, she made it her mission to support other women who experienced similar traumas. After retiring from the Navy in May of 2016 and moving with her family to San Antonio, Brett decided to pursue her bachelor’s degree at UTSA. The Massachusetts native and mother of two, is a multidisciplinary studies major enrolled in the UTSA Honors College. Brett is currently studying topics affecting women in the military community. “That’s my background. I was in the military for a long time and know the challenges women face firsthand,” said Brett. Brett secured the opportunity to network and hear the stories of several successful women from across the nation during the 2018 Focus Forward Fellowship hosted by the Military Family Research Institute (MFRI) at Purdue University in West Lafayette, Ind. The fellowship is designed to help student, women veterans build skills, leadership and a sense of community with their peers. The Honors College student was one of about 20 women selected from 18 different colleges and universities, representing five branches of service, to be chosen for this fellowship. “This was a transformative experience in a lot of ways. I gained professional development skills, learned about different leadership styles, had my resume reviewed and got tips on how to be successful during interviews,” said Brett. 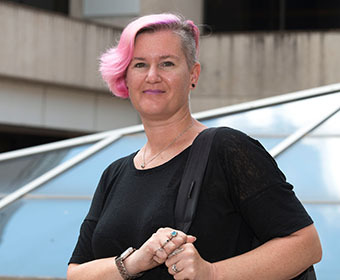 Brett says the experience changed her life and she now has a support system of empowering female colleagues and mentors that she speaks to regularly. The fellowship continues with web-based activities, while she’s at UTSA, that allow her to learn tips on how to apply for graduate school and achieve her professional goals. Brett is majoring in anthropology with minors in women’s studies and linguistics. She is expected to graduate in December of 2019 and plans to attend graduate school and is considering becoming a professor one day. “My goal is to somehow get these women’s stories on paper to be saved. The world doesn’t know the impact we’ve made on the military,” explained Brett. Learn more about UTSA Honors College.